Be the first to share your favorite memory, photo or story of Amadeu. This memorial page is dedicated for family, friends and future generations to celebrate the life of their loved one. 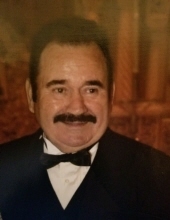 Amadeu Fernandes Loureiro, 82, passed away on Thursday, October 11, 2018 at University Hospital in Newark, NJ. He was born in Pias, Moncao do Minho, Portugal and came to the United States in 1968 and resided in the Ironbound Section of Newark. Amadeu was a Laborer and Member of the Heavy and General Construction Local 472 of Newark for 25 years, retiring at the age of 55. Amadeu was also a member of the Sporte Club Portuguese of Newark. Beloved husband of Maria Alice (nee De Sousa) Loureiro; devoted and loving father of Angelina Fornelos and her husband Carlos, Manuel Loureiro and his wife Idalina, Vera Watson and her husband Donald and Rosa Loureiro and her husband Gil Shaheen; brother of Alberto and Joaquim Loureiro, Maria Isidro Loureiro, Fernanda Loureiro and he is predeceased by 4 siblings; dear grandfather of Andrea, Rachael, Michael, Jennifer, Crystal, Amanda, Catherine, Armando, Gabrien and Zephen; cherished great-grandfather of Zaryah, Zaneil, Maylene, Marcus, Jr., and Alexandrea. The Funeral will be held on Tuesday, October 16 at 8:30 am at the Buyus Funeral Home 426 Lafayette St., at Wilson Ave, Newark, NJ 07105. Thence to Our Lady of Fatima Church, Newark, where at 9:30 am the Funeral Mass will be offered. Interment Holy Cross Cemetery, North Arlington, NJ. Visitation for Amadeu will be Monday, October 15, from 7-9 pm. Relatives and friends are welcome to attend. In lieu of flowers, masses said in Amadeus name and live plants would be graciously appreciated. To send flowers or a remembrance gift to the family of Amadeu F. Loureiro, please visit our Tribute Store. "Email Address" would like to share the life celebration of Amadeu F. Loureiro. Click on the "link" to go to share a favorite memory or leave a condolence message for the family.